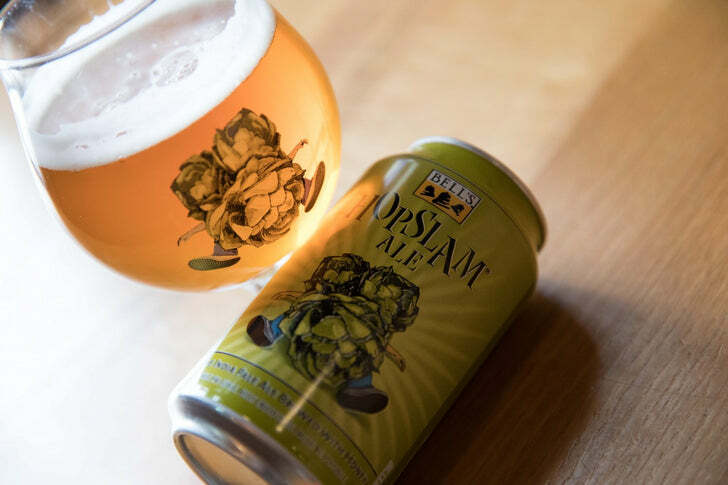 Bell's Hopslam is yet another Imperial IPA that brewers have been trying to clone for years, and (as far as we can tell) no official recipe has ever been provided by the brewery. While I wouldn't call the recipe below an exact clone, I find that it comes very close. If you enjoy the commercial version, you'll definitely enjoy this beer. Hopslam is a bit higher in alcohol than Pliny the Elder but the hops are not quite as intense. It is one of the few beers to score 100 on both RateBeer and BeerAdvocate. I brewed this for the first time on April 7, 2012 and then again in late 2012 making slight adjustments to recipe (shown here). In early 2013, a sampling was donated to a local team of homebrewers studying for the Beer Judge Certification Program. I'm told they deemed it the best IIPA of the group, rated against many other homebrewed and commercial IIPA examples they were studying that evening. 1.25 qt/lb mash thickness. Single infusion mash at 150F for 90 mins (or even 120). Mashout to 168F. Kal - did you actually make this one? Has anyone personally drank it? Of course! I don't post any recipes I haven't personally made myself that worked out well. I've made it twice now, first time on Apr 7, 2012 (batch #140) and then again on Dec 9, 2012 (batch #150), with slight alterations between batches. I've tried the commercial beer as well and liked mine better (found it fresher). I've personally drank it myself, along with many other hop-head friends. Link Posted: Wed Jul 03, 2013 7:11 pm Post subject: Honey huh? So Bell's actually uses honey and not table sugar in the recipe? I suppose they both serve the same purpose - to dry the beer out some. Link Posted: Wed Jul 03, 2013 7:21 pm Post subject: Re: Honey huh? So Bell's actually uses honey and not table sugar in the recipe? I suppose they both serve the same purpose - to dry the beer out some. It's not uncommon for high gravity beers (IIPAs, Belgians Tripels, Barley wines, etc) to use some amount of 100% fermentables to avoid the final gravity from being too high. This ad confuses me a bit however: 7.2 cases is 24 x 7.2 = 172.8 beers. They say that IBU numbers above 100 are somewhat meaningless and break down above 100, but I would find it hard to believe that Bells uses enough hops to bring Hopslam to the equivalent of 1600 IBU. I just got a 6 pack of Two Hearted Ale. I'm going to culture up the yeast from the dregs. I've got plans for some clones, including Hopslam. This ale is one of the reasons I returned to home brewing. I hope to make this the third brew in my new system. Recipe looks great, but isn't Hopslam more like 68 IBU? Bell's has said themselves that it's much lower than people think. Ratebeer.com has it listed at 70 IBU. 161 sounds crazy high. Not sure - I don't place much faith in calculated IBU numbers once you get above 50-60, especially when there's lots of late hops and processes like FWH or steeping. Looking at the recipe again in beer tools pro, I realize that this software treats FWH as a full 60 min boil when in fact in the "real world" a FWH adds bittering similar to a ~20 min addition. This drops the IBU down to the 140's. Then there are a huge load of late hops in this and depending on which IBU curve you use for calculations, the numbers can vary greatly. I've seen clone recipes with IBUs that range from 93 to 160. These are all "calculated" IBUs. If you are to send this beer to lab it'll actually measure a lot lower as all bets are off with anything over 50-60, and definitely over 100. I basically don't care or place any stock in IBU numbers for any very hoppy beers like a DIPA. They didn't claim 172.8x IBUs, but "amount of hops." Since there aren't any actual hops in the finished product, but components extracted from the hops, I take their claim to mean that they use 172.8 times as much in making the beer. A lot of that could be late hop additions for which IBUs are not extracted, but other components (flavor and aroma) are. And the "popular light beer" could be using hop extracts as well, further reducing its "amount of hops." I could argue the extracts should be counted based on the input hops, which will still give a lower amount because the extraction process is more efficient than a boil with wort; should be counted just on the amount of extract; or aren't hops at all. Good points foomench - that's probably exactly where it comes from. 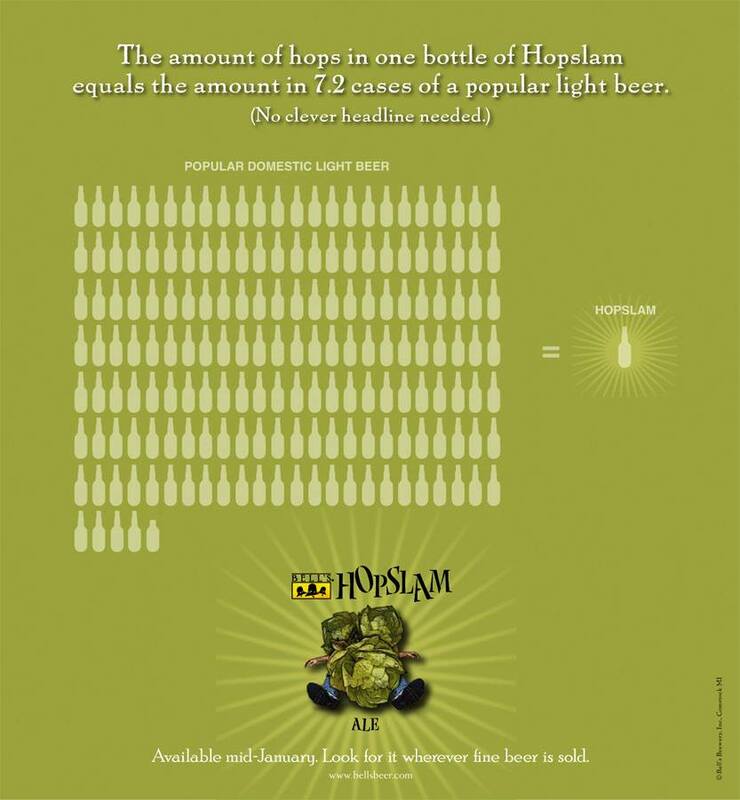 I don't doubt that HopSlam has a ton more hops in it than a typical light beer - just wasn't sure on where the math comes from. Can you clarify your crash chilling process? I notice you do this in several recipes. How long do you hold it in the brite tank at this temperature? You add the gelatine during this time? I don't normally do (2). I normally skip it and do it all room temp, but doing it near freezing will help it clear faster. When I do do (2), I hold near freezing with the gelatine until clear. Usually 2-3 days is all that's needed. After that I keg. Always purge any vessel with C02 before racking too, to avoid oxidation. Thanks! I was thinking maybe you just crash it down to near freezing, and then let it rise back up to room temp on it's own. Nevermind. I was lucky enough to get my hands on a six pack of this years HopSlam. A customer came into the local homebrew shop I work at and let me know that the ABC Liquor down the street got some in. After the customer left, I put up a sign "went to grab lunch be back in 15 min" and drove down to the store. I bought a six pack. There was only one case left. Hey fellow brewers! I had the pleasure of brewing 12 gallons of Kal's Hopslam clone about a month ago, and I have to say that in all my years of brewing, it is the best batch, hands down, that I have ever brewed! I followed the recipe (including adjusting the my water) and the final product was simply amazing: Wonderful piney, dank, citrus, grapefruit on the nose, amazingly full body with a true "hop slam" on the palate, and a surprisingly dry finish for such a big beer. Thanks for sharing your recipe, Kal... this one is a winner! What domestic 2-row do you recommend? Pale Malt, Briess Pale Malt, Malteurop? I am new to this and would really like a close copy of this beer. Any low colour (~2L) 2-row will work. Any subtle differences will be completely lost in the hops. Note that most malt is 2-row so don't get confused with the names and buy 'pale malt' as that's usually slightly darker. Get something that they're actually calling 2-row or domestic 2-row like.